"Chaji" is a formal matcha tea ceremony and the traditional Japanese kaiseki meal is also prepared to enjoy with the tea. 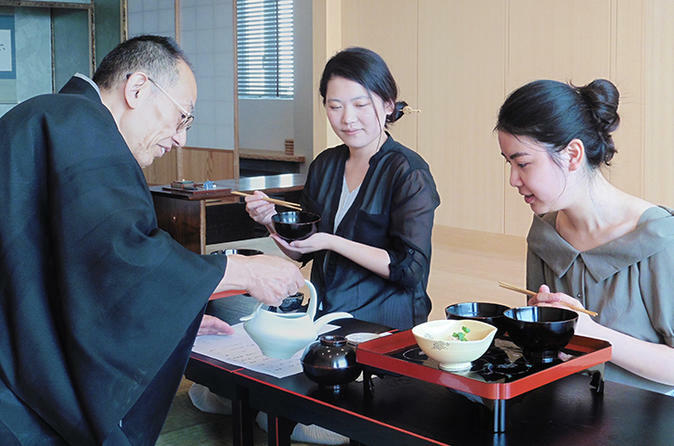 Book this tour to experience a formal way of chaji from a professional instructor while enjoying the authentic taste of Japanese kaiseki meal. Meet your guide at the Futako-Tamagawa Station in Tokyo (approx. 40 mins from Tokyo Station) in the morning and experience one of the most authentic Japanese traditions - Chaji. Chaji is the fundamental of current tea ceremony and its intention is the culmination of tea ceremony culture. Originally, Chaji was just a hospitality cuisine served by owner of the house, and full course of the Kaiseki cuisine was prepared as an companion role for Japanese matcha tea. In the past, the owner of the house used to arrange interior, dishes, equipment, and even flowers just for a single chaji event to accommodate guests with the ultimate hospitality. You will participate in the chaji event by experiencing the ceremony and tasting matcha tea while enjoying the traditional Japanese kaiseki lunch. The meal will include five plates kaiseki-style cuisine, Japanese pickled vegetables, and sake (or water). Experience Japanese traditional chaji and learn the essence of this event. Your professional host will accommodate you and teach you A to Z of chaji.